Benton Lee’s Uvalda, GA After an approximately 35 minute drive from the RealSweet Vidalia onion fields of Shuman Produce in Reidsville, Ga (where we had been filming recipe videos all day, I was tired, thirsty and hungry) I found myself along the beautiful Altamaha River at the legendary BIG STEAK house of Benton Lee’s. I arrived at approximately 5pm and I was the only car in the very large lot…I was a little concerned. Soon my worries were abated by the friendly and helpful greeting of Jill. She told me to sit anywhere I liked (I was the only one there, but that was soon to change) the restaurant was large, clean and country, I loved it, I grabbed a menu and Jill was tableside within minutes. Jill could tell that I wasn’t from around these parts, (Benton Lee’s is a short drive outside of Vidalia, GA) so she walked me thru the process of ordering. I wanted the BIG sirloin…I had no idea how big it would be so with Jill’s council I ordered grilled onions and a side salad as coleslaw, fries, and a roll come with the meal (the side salad in case I didn’t like the slaw) and an unsweet tea. She cheerfully approved of my order and left, directing me to the big tea urns located in a couple of different locations for convenience, “hep yourself” she threw back over her shoulder as she headed to the kitchen. About 20 minutes later Jill returned table- side with an extremely large stainless steel plate LOADED down with the second biggest steak I had ever seen in my life (the first being the 72 oz Big Tex in Amrarillo,Texas) and I was stunned by its enormity. It was cooked to perfection, HUGE tasty and juicy…the grill marks were beautiful and the sides were good (the slaw and the salad are very basic but fresh and tasty) everything was served hot as appropriate and the feasting began. Jill was kind enough to give the story of the legend of Benton Lee, for you see, there really was a Benton Lee and she had worked for him (Benton Lee retired after 40 some years when the restaurant burned down in 07 I believe) and the new owners rebuilt the steakhouse, one of the owners being that of the lovely and kind Vickey Tapley…it was about that time of the story that Jill excused herself and Ms. Vickey came by to say hello and ask my thoughts about the food. Ms. Vickey gave some more history and shared some of the celebs that had been to Benton Lee’s and the visit albeit fairly short was very enjoyable (we had pictures together before I left). After 45 minutes I surrendered…the steak was GREAT, now for my thoughts on the sides, the French fries are made fresh daily and were good (if you are a fan of fresh made fries), the coleslaw was simple but very tasty everything else was good…I wished I coulda had a bigger bun or big hunkin chunk of Texas toast to sop up the steak juices as they were deep on my plate and sooooo good. Jill came by to check on me and inquired as to my thoughts of the food and she seemed very pleased by my response (more so than the usual employee enthusiasm) I later found out that she not only took the order, she fresh-cut my HUGE steak on the band saw, made the coleslaw that morning, took my order, served my food, cleared the table and met me at the desk to take my card…a jack of all trades and a smile the whole time. At Benton Lee’s it truly is about the “cow”, however they have plenty of other dishes from frog legs to quail, fresh chicken tenders to pork chops, catfish to alligator….it’s all here at Benton Lee’s. I will admit this was my first and only real experience here but I had many people tell me about this legendary steakhouse and I am sure glad I took the time to find it (thanks to my Sprint navigation). 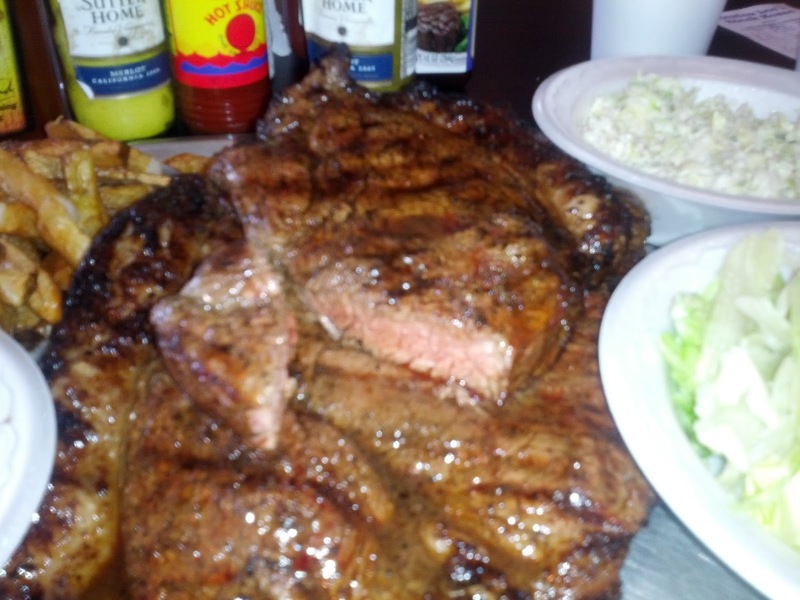 The steak lovers can get T-bones and sirloins…they also have a sirloin for two…how HUGE that must be. They had to cut mine almost in half and stack it on top of the other huge piece to get it all on the plate. If you want an excellent steak, comfortable scenic relaxation (except on weekends when I here it’s packed ALL of the time but still scenic) and you long to be out away from it all. Try Benton Lee’s in Uvalda, GA you WON’T go away hungry and if you get the chance to meet Ms. Vickey or have the pleasure (Wed and Thursdays) to meet Jill, you will leave with a smile on your face and a notch extension in your belt! My to go box (which I have NEVER taken in my life with steak) was filled with a HUGE piece of steak, fries and grilled onions…the whole meal including tax, tea et al….$30.00 I kid you not. I do not know how big the big sirloin was but it had to be pushin an easy 28 oz’s (small and medium size are available upon request of the sirloin and t-bone). Benton Lee’s is only open Wed-Saturday 11am-9:30pm so plan accordingly but certainly plan.